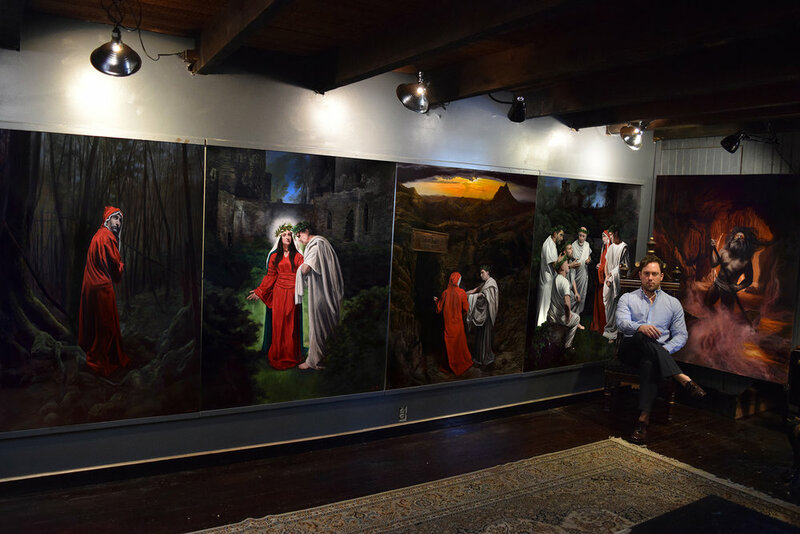 Eric sitting with the first five completed panels in his Dante's Inferno Painting Series, February 2018. I’ve chosen to paint 40 panels at 4ft x 5ft with the intent of displaying them together in the most comprehensive and realistic depiction of the poem to date. The reason for the size is simple, I want these images to take on an almost life-sized presence to draw us in body and soul to the world Dante Alighieri created almost 700 years ago. Because this tremendous undertaking requires vast knowledge on the subject of the Divine Comedy to render accurately, I began immediately searching for the most well-known expert. I was thrilled when Professor Christopher Kleinhenz, a world-renowned Dante scholar agreed to assist me in the creation of this series. For the next few years, we will be working together in the pursuit to create the most accurate visual depiction of the poem. You can see the progress on my blog at this link. The completion of these paintings will then culminate in a traveling museum exhibition and a large, full-color painting book on the subject narrated by Professor Kleinhenz. The goal for the projects is set for 2021 – the 700th Anniversary of Dante’s death. In order to keep up with the demand for materials and time to paint this ambitious project and to support himself, Eric is selling the original panels in the series for a discounted price. This is a limited time offer. Each painting is 4ft x 5ft on AlumaComp panels, which are aluminum panels with a polyeurathane core. They are archival, museum-quality and will not warp or deteriorate. Each collector will have a chance to choose their painting from the entire 40 panel series in the order they contribute to the project. There are several collectors who have contributed so far which have helped get the project started but additional investors will be needed to see this enormous project through to the end. Some supporters have opted to make a one time donation to the project. These donations help with the day to day expenses in my studio and help to sustain my household as I take on such a large self-funded series. Thank you for your support. For as little as $5 you can be a regular contributor to my Dante's Inferno painting project. Your monthly donation will help fund all of the art supplies including paints, brushes, gesso, medium, solvents and other art supplies necessary to help me complete this epic series. There are several levels you can contribute from $5 to $100 a month. Contributors get behind the scenes information about the project and even a one on one video chat about the project. To contribute to my Patreon campaign click here. Many collectors have already purchased original drawings from the Dante's Inferno series from my store. Click here to see the current inventory. Aside from preliminary drawings from the series I have a number of charcoal drawings, limited edition prints and two artist books available for purchase. See an example of one of the original drawings below. THANK YOU FOR ALL OF YOUR SUPPORT!!! As many of you know, I've embarked on the largest artistic journey of my life in mid 2016 when I decided to paint the most comprehensive series on Dante's Inferno. At the time, I wondered if people were taking me at my word. Now, over 18 months later, the public is finally starting to understand the scope of what I've taken on. However, the most challenging dilemma for me is how do I engage in a project this large without it disrupting my life. Sadly, the answer is that there is no way for it not to. In the last year, I was forced to take on a lot of commission work in order to keep my family supported while I was also working on this project. The result? I was only able to complete less than 5 of my projected total of 12 each year. If I do not find other ways to support this project, it may not be completed in time for the 700the anniversary in 2021. The importance of having the series on schedule is to make certain I'm ready for the show in Florence, Italy and the venues set up in the states. Your monthly support, no matter what level, will enable me to see this project to the end, and grow a larger audience, which will only secure the success of the published book and the notoriety of the series. © 2018 Eric Armusik - all rights reserved.